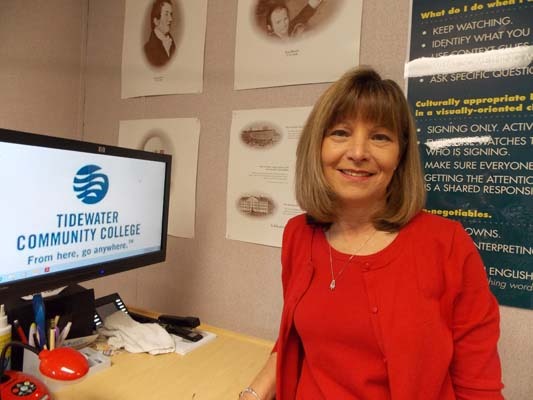 Business Professor Linda Williams has become the face of Tidewater Community College’s Textbook Free Degree. She’s been featured in countless articles and television interviews about the cutting edge program that enables TCC business students to earn an entire degree while spending zero funds for textbooks. Launched in fall 2013, TCC’s “Z Degree” – “z” for zero textbook cost – was created to ease the pain of soaring textbook costs for college students. TCC partnered with Lumen Learning, a Portland, Ore.-based company that helps educational institutions integrate open educational resources into their curricula. With the Z-Degree, from the first day of classes, students have access to the open educational resources selected for their learning. “We’re seeing very engaged learning and a creativity flow that’s very dynamic,” Williams added. Williams says that the Z-degree is her greatest professional achievement and she credits the faculty team she works with and administrators Kim Bovee and Daniel DeMarte for their dedication to the project.